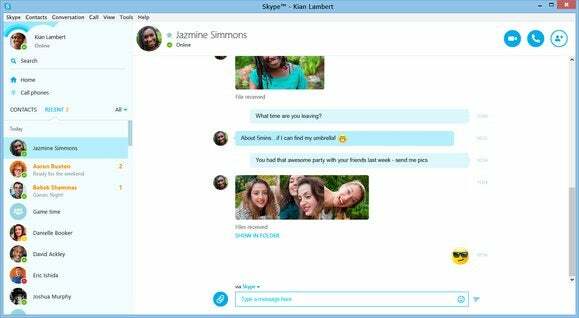 Microsoft released Skype 7 for Windows on Friday, complete with a more touch-friendly interface, and a new compact mode to help cut down on the screen space the app consumes. The new preview version of Skype 7 for Windows debuted in October, alongside a new version for the Mac. In that version, Skype chats dominated the available white space, with large emoticons taking up much of the screen. Microsoft said in its new, final release that it had included a new compact view in response to user feedback. You can find this update under both “View” as well as Tools>Options>IM Settings, Microsoft says. Skype hasn’t pushed the update to my PC yet, so I can’t tell you whether the screenshot Microsoft provided above represents the compact view or not. The other change Microsoft made to the final version of Skype 7 is that it’s now touch-enabled—a welcome change. My large monitor is not touch-enabled, but my second display is. Now, if I have a webpage on my big screen, Skype's touch features will let me slide a window around on my second screen without a mouse. While consumers will probably care more about the new layout of Skype 7, it’s also a milestone day for business users: Skype and Lync can finally talk to one another. Skype users can call Lync contacts, and vice versa. Visually, the experience should be seamless, although Microsoft said it had done a lot of work behind the scenes—securing the media and signalling protocols using TLS and SRTP, enabling H.264 video, and using the SILK audio codec for Lync calls. A Lync user places a call to a Skype contact. There are some caveats, unfortunately. For now, Skype for Windows can talk only to Lync 2013 clients. 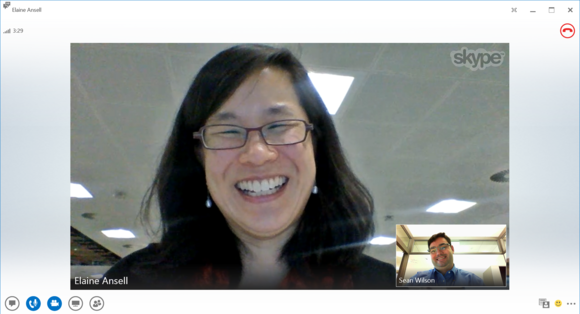 Support for Lync-Skype video calls will be added to Android and iOS over the coming months, Microsoft said. In 2015, when Lync becomes Skype for Business, more support for SkypeIDs and Skype contacts will be added. Why this matters: Actually, it may not matter as much as Microsoft hopes it will. Consumers tend to expect products to work, and may not leave much more than a positive star rating on an app that works as expected. But while Microsoft fiddles with Skype’s user interface, customers are burning Skype online: Microsoft’s Store app is filled with complaints from customers who say Skype either doesn’t work or works less effectively than it used to. The Skype team might want to reach out and solve those problems next.